Located in the heart of Primrose Hill village and occupying the two top floors of this classic Georgian building, this stylish and beautifully furnished two bedroom, one bathroom duplex apartment has been interior designed to an excellent standard. Upon entering the apartment you immediately notice the abundance of natural light throughout. The first floor offers the main living space with comfortable seating, TV and WIFI, optional dining area, fully fitted modern kitchen with washer/dryer, all cooking utensils and breakfast bar. Light and airy twin bedroom with two single beds which have the added benefit of being joined to make a double bed, and good storage. Gorgeous family bathroom with shower over bath and WC with stainless steel fixtures. Taking the stairs to the second floor, you will reach the stunning master bedroom with a 7 ft X 6 ft american king size bed, an abundance of storage and the most wonderful views over the village of Primrose Hill and the London skyline. 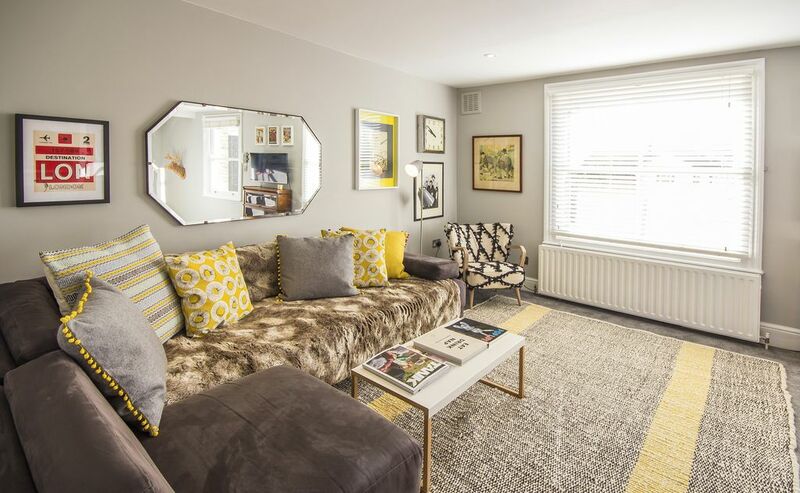 Situated within one of the most leafy and sought after streets in Primrose Hill, minutes from Regents Park and surrounded by a wealth of wonderful shops and eateries. Primrose Hill is one of London's most prestigious neighbourhoods as it offers the perfect blend of convenience to other parts of London, stylish shops, as well as a mixture of casual cafes, local pubs and fine dining. Wonderful open spaces to marvel at the views of London. Only a 5 minute walk to Chalk Farm tube station which serves the Northern line and connects to Oxford Circus and many other tube stops in less than 12 minutes. Heritage Apartment Rentals is a London based short term rental agency offering accommodation in London’s most exclusive neighbourhoods. Whether you are here for a short stay or several months, enjoy the benefits that vacation rentals have to offer, relax in your own space, soak up and explore the local areas and really live like a local! With our portfolio growing we are certain that with our unique and bespoke approach we can find you the best solution for your stay. Beautifully designed, sought after location and wonderful views over of the London Sky line. Duplex style, interior designed, moments from Regent's Park. Cute apartment in a great location! Flat is in a great location, has a lot of space for 2-4 people, and is well maintained. I'd plan to stay again if have the chance. If you are not familiar with Primrose Hill, this flat and location is ideal as it is a quiet area, but very close to central London. Plus, the High Street is one of the best in the area for a leisurely afternoon. Loved this apartment! Would gladly return. This is a lovely, clean apartment in a sweet neighborhood with coffee shops, restaurants and little markets nearby. Four of us were very comfortable and thoroughly enjoyed our stay. Beds were super comfortable! The management company was great—responding to our email inquiries quickly. We were met at the apartment and handed keys and provided a quick tour. As described there are stairs to climb, so be mindful if that will work for you when considering a reservation. There is also a bigger step up to get into the shower. I've stayed at several VRBO's now and this one was one of my favorites. Thank you very much! We loved staying here and would gladly return. Really great property for two people or a family of four or less that wants more room than you can get in a hotel and at a very good price. Nice and cozy and well maintained. We were very comfortable there and very sad when we had to leave. Nice location near Primrose Hill and Regents Park. Five seconds from your front door you have a nice high street with several nice restaurants and pubs. Five minute walk to Chalk Farm tube station, which then was a 15-20 minute tube ride into Covent Garden/Leicester Square area. Close to northern line chalk farm tube stop, 30 min away from just about any attraction in London. Managers of the apartment very responsive to all of our questions. Quiet neighborhood. Only cons were lots of stairs and if you have mobility issues, bathroom tub set up may be challenging. Lovely smallish flat in great location just off the high street in Primrose Hill. Perfect for our family of two adults and two teenagers. Very clean, stylishly decorated, comfortable beds. Was very warm whilst we were there but fans were provided for every room. Quirky bathroom, several steps up to flat and then to master bedroom within flat. This small, grassy, hilly park, boasting fantastic views over London, has become increasingly popular with the young, the trendy and the famous. It's a great place to stroll through and take in the scenery. Having climbed the steep slopes and admired the panorama you can regain your strength in one of the many cosy cafés, restaurants or pubs nearby. One of the most pleasant ways to approach the park is to get off at Camden Town and walk along the canal. The Primrose hill district is surrounded by the affluent areas of St John's Wood to the west, Swiss Cottage to the north west, Belsize Park to the north, Chalk Farm to the north east, Camden Town to the east and Regent's Park itself lies adjacent to the south of the hill itself. The nearest stations to Primrose Hill are Chalk Farm tube station to the north east and Swiss Cottage tube station to the north west.